Attempting to provide more round-up entries in response to requests by friends and followers means we are being a bit slower than usual in the rate of posts. There is, after all, some sort of limit to the times we can eat out. And this one also took a little time because although we are prepared to eat almost anything in serving our readers, the weight we added over the Christmas celebrations has meant some dietary restrictions. This particular topic has doubtless increased our cholesterol level. Breakfast to us is the first meal of the day – luckily Wikipedia agrees. This, of course, means it can be taken at any time and, although we are not late risers during the week, we certainly are at weekends. However, all the breakfasts described in this post were eaten before noon. This is really just the first installment in covering a substantial topic that illustrates the variety of what’s on offer. 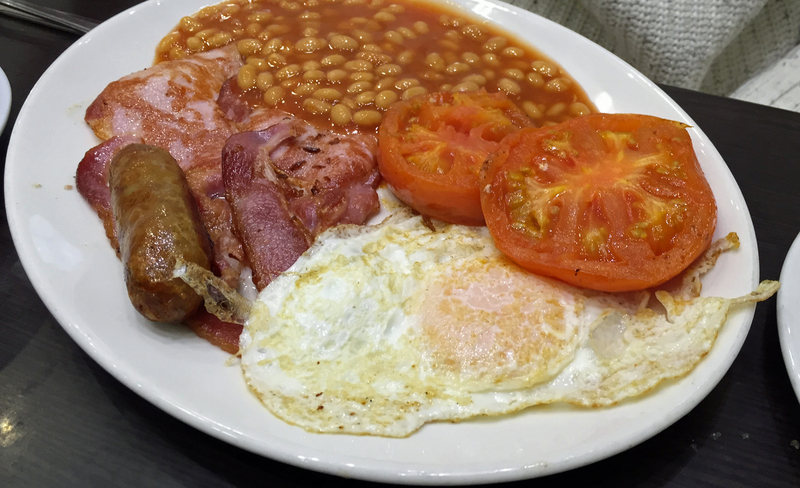 In particular, there will be more to come on that topic of regular debate; where to get the full English variety. 1. Duck egg café, 424 Coldharbour Lane (see this link to our full review) is still a favourite and we were drawn in on our way to another eatery because it was relatively empty (although we have noticed that this is not the case on Saturdays). As the name implies duck eggs abound. Breakfasts do not come in the same form as a greasy spoon and the differences are accentuated by the menu. For example, we had the Ottoman and the Catalan breakfasts. 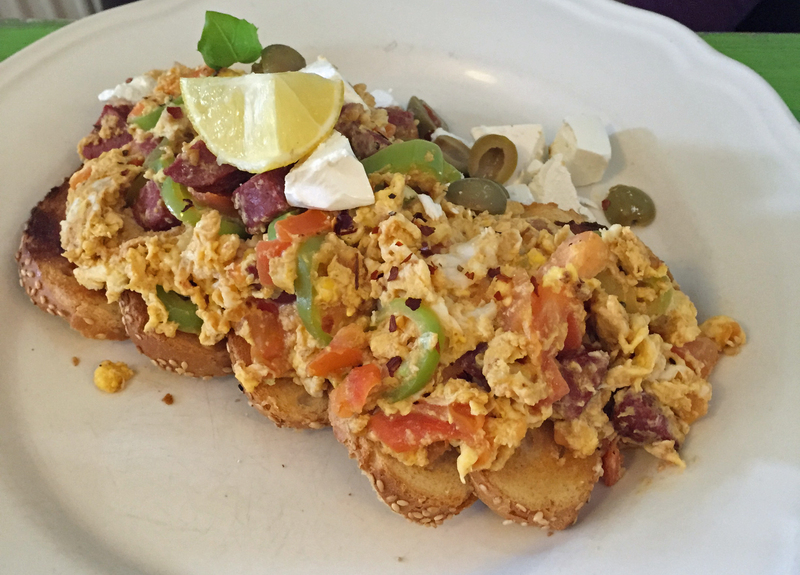 The Ottoman came as a revueltos (Spanish name for scrambled eggs with other stuff) and contained a spicy lamb sausage called sucuk and was served with peppers, tomatoes and olives. 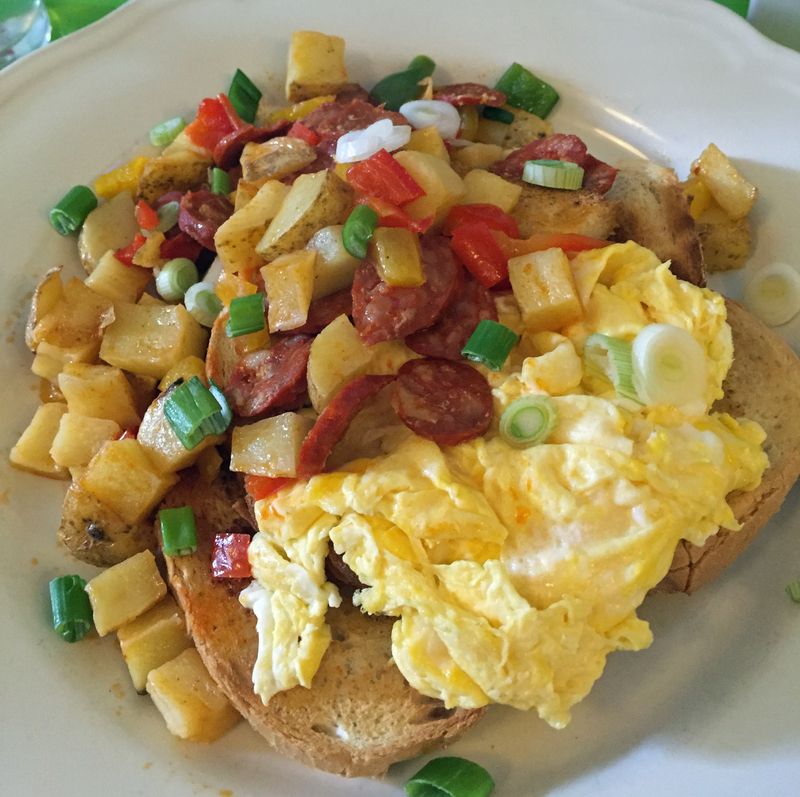 The Catalan was made up of scambled egg on toast, chorizo, saute potatoes and spring onion. Both came as very large portions that were really hard to finish. You can, of course, also have a full English here but you would need to work out what that was on the menu. The tables and chairs are not comfortable and packed in tight, so there is little room to spare. Once in your seat it is unlikely you would want to shift around and you can certainly share conversations with the next table – in fact it is hard not to. This caused some embarrassment as we overheard an angst ridden individual getting advice from her spiritual counsellor about whether to contact a certain young man who had only recently “found God”. For the first three minutes it was fascinating but then we felt we need to eat quickly and leave before we joined in. The price was higher (nearly £20) than for other similar venues but then you do get very large portions and something a bit more exotic. 2. Phoenix, 441 Coldharbour Lane (see this link for more information) This comfortable café is always filled with discussion groups, parents on their way back from the Leisure Centre and tables of one or two people. This makes it less intimidating for a lone person, which is not always the case for the cafes in Brixton. We both decided to try a cholesterol special – fried egg, Cumberland sausage, bacon, baked beans. It comes with toast or bread and butter as well as coffee or tea. There is a choice of one extra element and between the two of us, we chose tomatoes and mushrooms. Both of these are definitely a test of culinary skill. 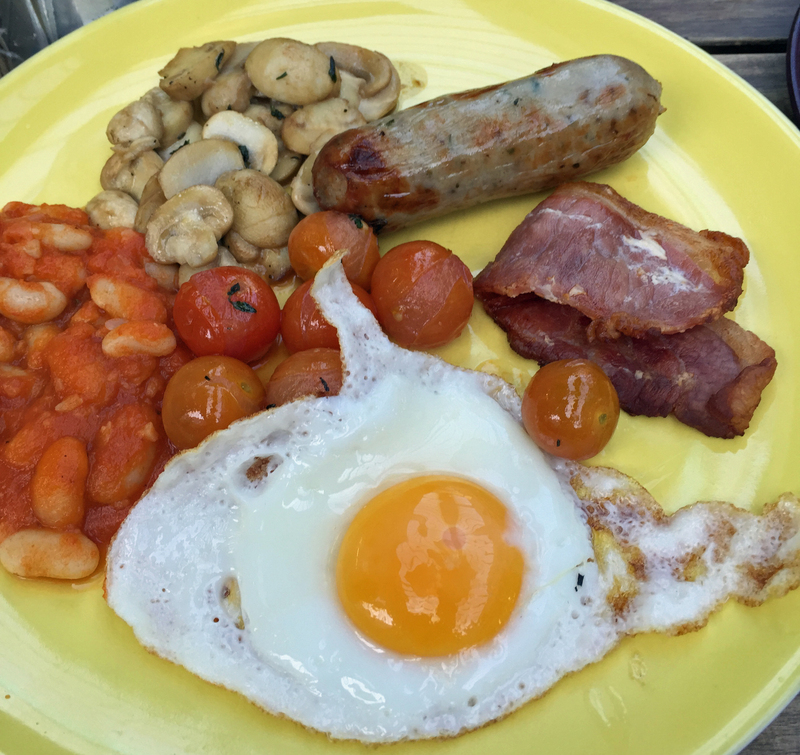 The breakfasts were a delight – eggs just right with runny yolks, Cumberland sausage was a whole scale away from the usual greasy spoon offering and loads of bacon and beans. The toast was also hot and buttery. They passed our two skills tests with flying colours. The tomatoes were cooked through – increasing the Lycopene which is good for your heart – we felt we needed it after all the breakfasts we had eaten. The mushrooms that all too often are served soggy and tasteless just weren’t. They had been sauted to perfection. Their tea and coffee were served promptly and although the coffee wasn’t top class the tea was fine and if you are a coffee snob you can always ask for the latte. The whole meal came quickly and the waitress knew exactly who had ordered what, even though the place was filling up. 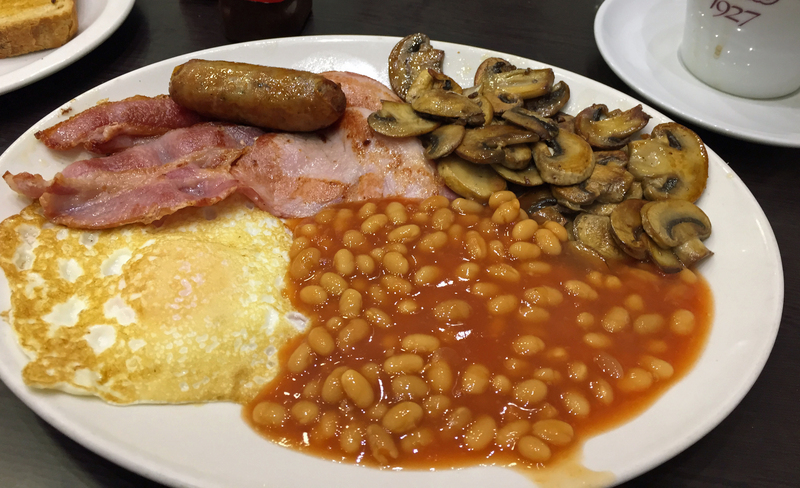 They serve an all day breakfast at £6.95 including coffee or tea and your choice of toast or bread and butter. There were other choices for breakfast including fish and chips or baguettes and other drinks, including fruit juice, but for a full English this is hard to beat. 3. Burnt Toast, (formerly Breads Etcetera) – 88 Brixton Village, (see this link for our full review) This is a café with standing space inside and tables, chairs and toasters outside in the arcade. It was more than a little chilly on the day of our visit but they provide blankets. On this particular morning the chill was obvious by the butter getting harder over time, despite the warmth of the accompanying toast. 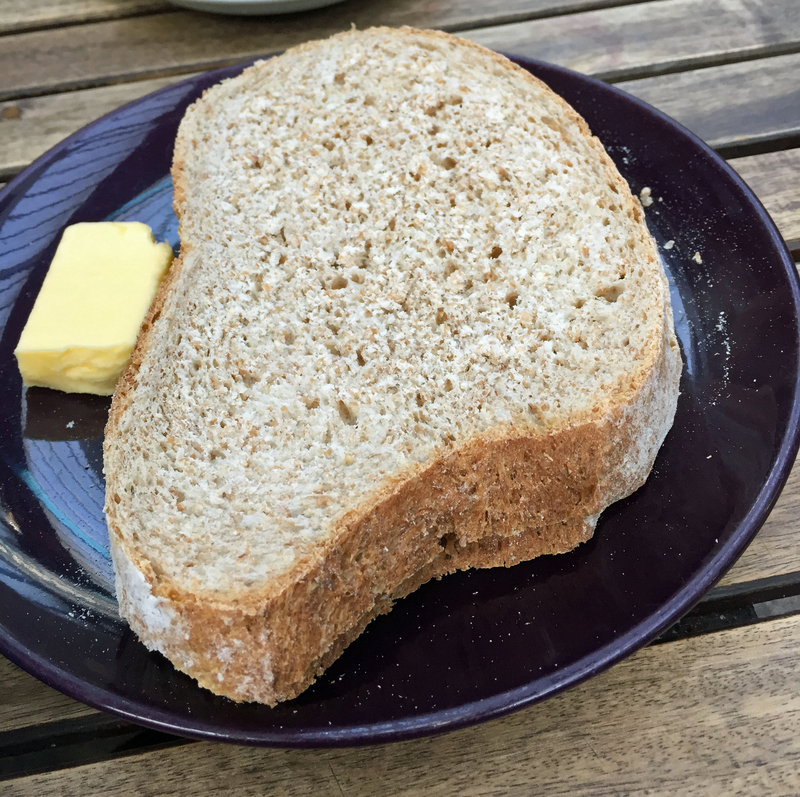 The concept is toast or full English or to our delight – a half English. 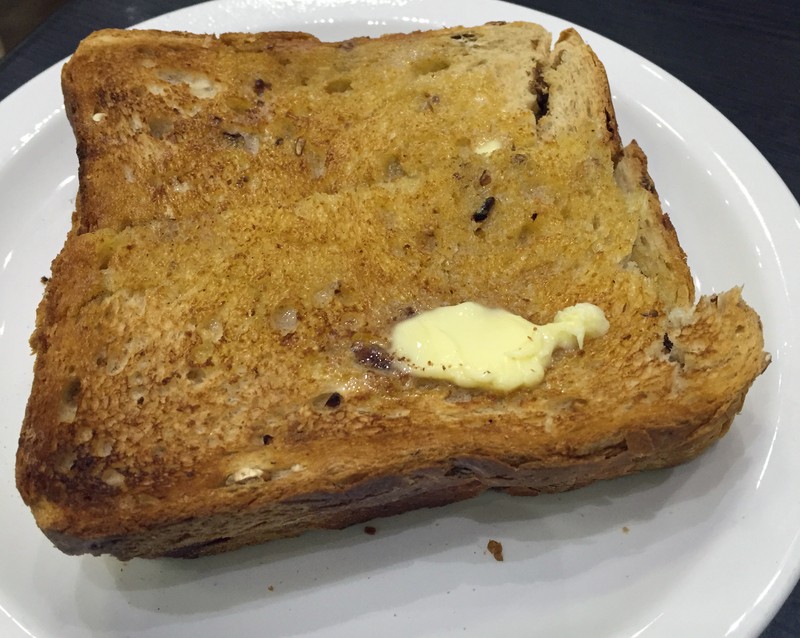 We chose toast – choice of bread, your own toaster and you select the topping (marmite, marmalade, honey or jam). The half a full English comes with a sausage, mushrooms, beans, roasted baby tomatoes and beans (haricot beans in a tomato sauce). In comparison to the Phoenix, the sausage was the same, the mushrooms not as good, the tomatoes probably a little better but the beans a disappointment as they were not warmed enough. So overall, not quite as good. 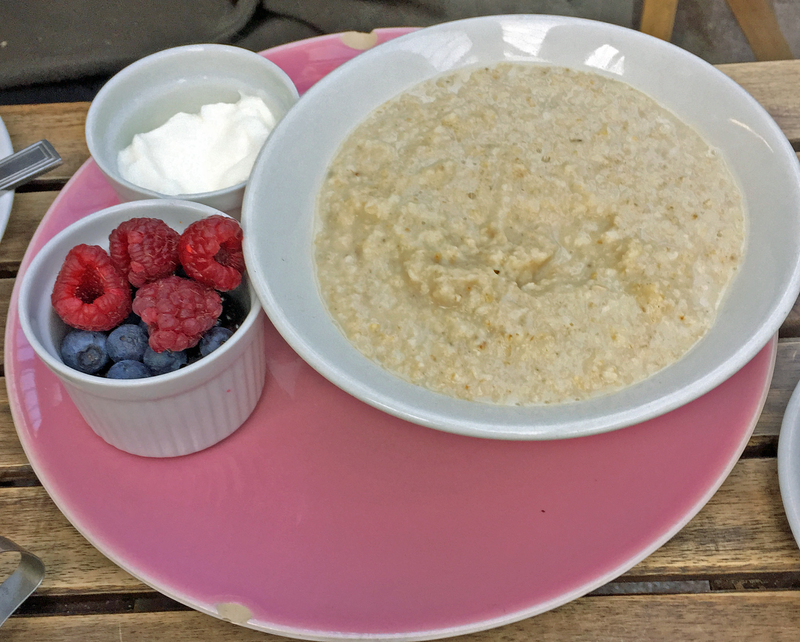 We also chose porridge. This was the Mama Bear’s variety – thick and too cold. It comes with sour cream or yoghourt (we weren’t sure which) and a small pot of berries (blueberries, blackberries and raspberries) which were delicious if a little cold too. We ordered tea and a coffee and the whole meal came to £15.20. We thought that they needed more feedback on having warmer plates and not letting food languish through a lack of logistics to get both plates out together. But we would certainly go back for a light breakfast of toast and coffee.